14″ high x 10″ wide, white acrylic card holder with sign holder. 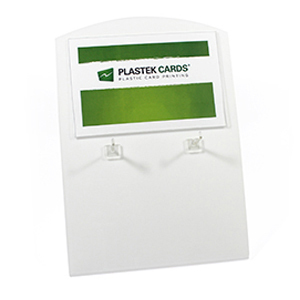 Two 2″ long hooks hold prepackaged cards in carriers or hanging breakaway cards. Sign holder allows for easy change out of promotional material. Clear sign holder is 8.5″ wide x 5.5″ high.